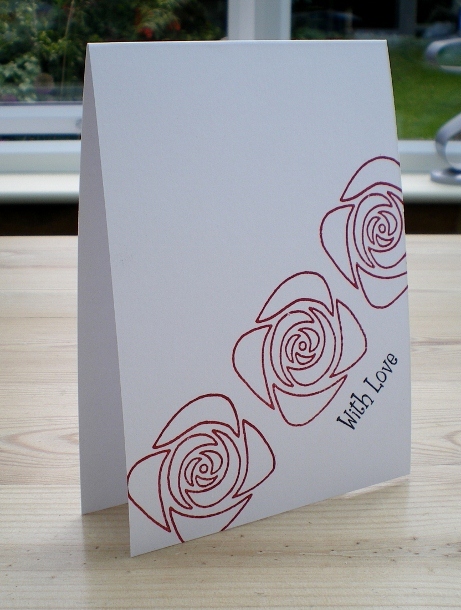 By one layer we mean one piece of card folded in half with no additional layers. 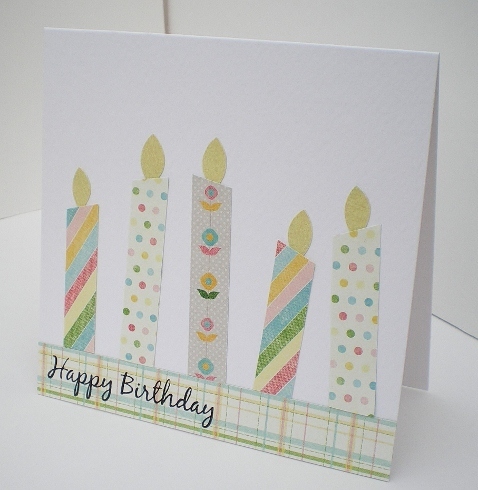 The image can be stamped or printed directly onto the card stock with minimal embellishments. 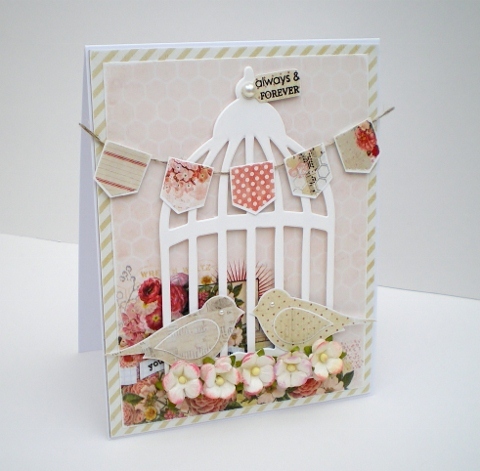 Looking forward to seeing all you one layer cards for this challenge. Check out the Let's Craft and Create Blog for some fabulous inspiration from the rest of the Design Team and the prize up for grabs for one lucky winner. 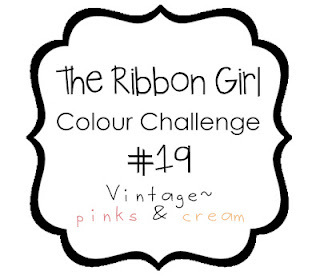 It's colour challenge time over on The Ribbon Girl Blog. This month the colours are vintage pinks and cream. I needed a storage solution for all my pretty pins, somewhere to keep them within easy reach out on my workbench. All the time they're tucked away in a box I forget to use them. 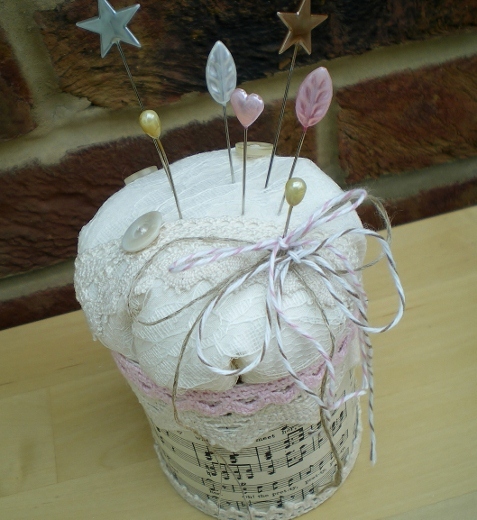 So, I found this quickie pin cushion tutorial HERE, it's the perfect solution for me and only took a couple of hours to make. Who'd have thought it started life as a cocoa tin, it's amazing what a few metres of pretty lace can do. 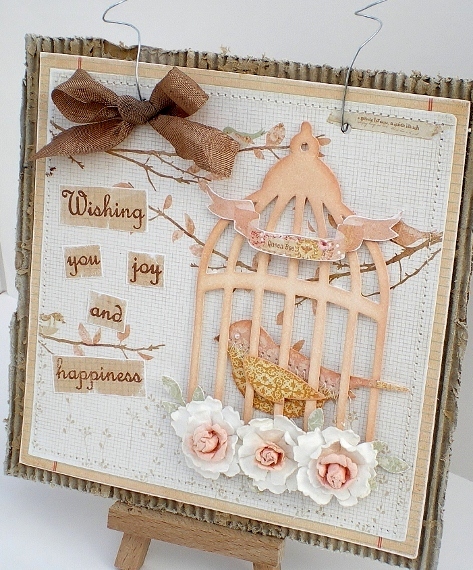 Check out The Ribbon Girl blog for some beautiful cards and projects from The Ribbon Girls, entry details for this challenge, plus news of the fabulous new designers that'll be joining us next month. My day to post over on the Bubbly Scrumptious blog again today - the weeks are flying by far too quickly! 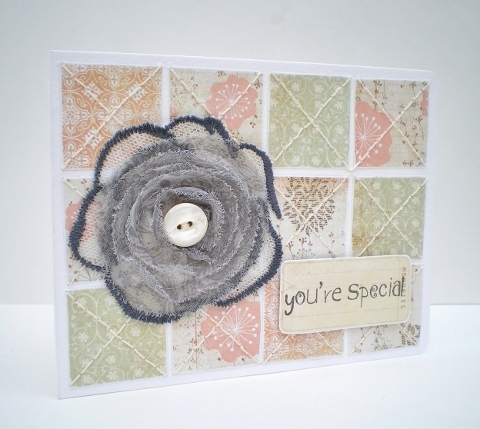 This week I've made a quilt inspired card using hand stitching with this pretty Prima flower as the focal point. 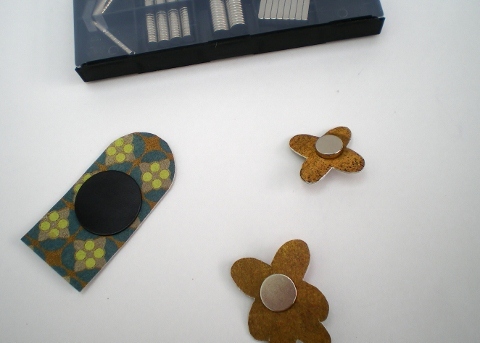 I always like to have some ready made flowers in my stash for those times when I haven't time to make my own. 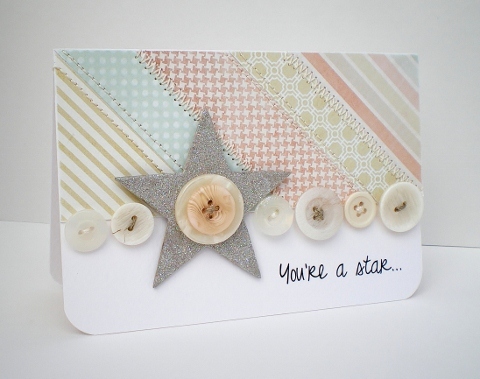 There's a full supplies list and a step-by-step guide to hand stitching on cards HERE on the Bubbly Scrumptious blog. Inspired by my blogging pal Katie, I attended a beginners crochet workshop yesterday. 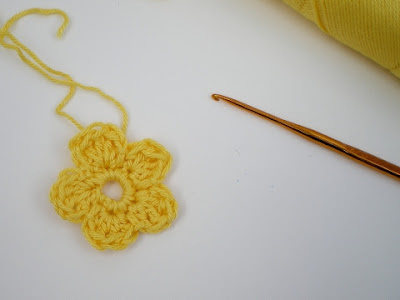 In only two hours I'd made a flower! A big achievement for a complete novice like me. I had such a great time I'm going back next week for the intermediate class, best get practising! 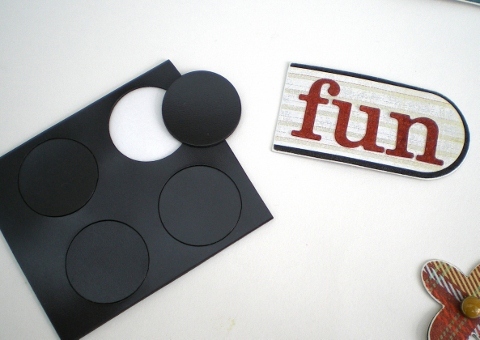 It's time for another challenge over at Let's Craft and Create. This time the theme is 'Stars in Your Eyes'. Check out the blog for some fabulous inspiration from the rest of the Design Team and the fabulous prize up for grabs for one lucky winner. 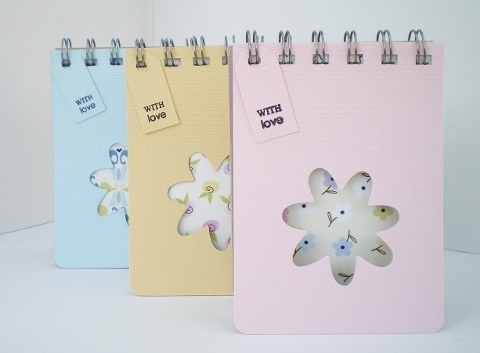 Just wanted to let you know about yet another fabulous giveaway over on The Ribbon Girl Blog. 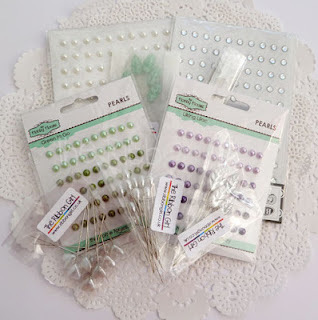 You could win a beautiful selection of pearls, gems and pretty pins from the Ribbon Girl shop all you have to do is pop over to the blog and add your comment to this post. Who'd have thought a wooden hanger could be so pretty. Going to give them both a try the next rainy weekend. It's been a while, but this week I've found time to enter the colour challenge over on the Less is More challenge blog. The colour this time is 'round is 'Yellow'. 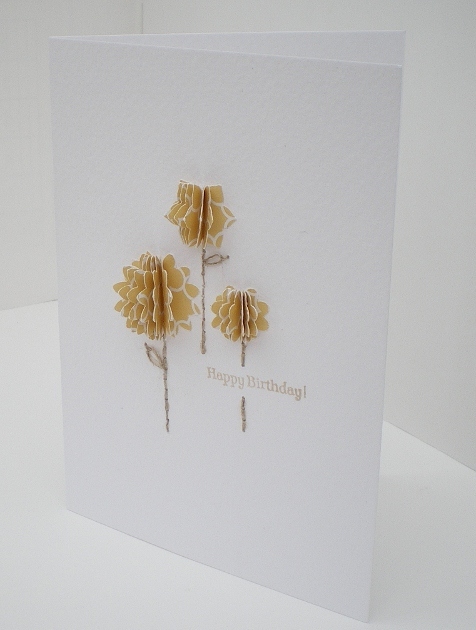 For my card I've created 3D blooms by folding punched flowers in half and gluing together, there's 7 punch outs for each bloom. Bit of a fiddle but I like the effect. The stems I hand stitched with some linen thread which gives slightly more texture than embroidery floss. 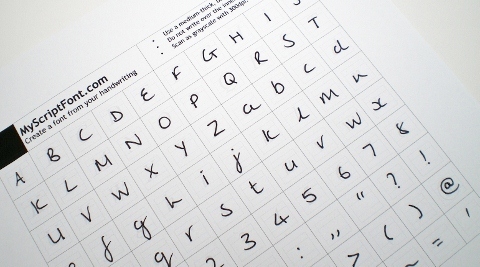 I'm off now to check out all the lovely entries I've spied on the blog. This week my make for Bubbly Scrumptious is a DIY 'Smash' book. 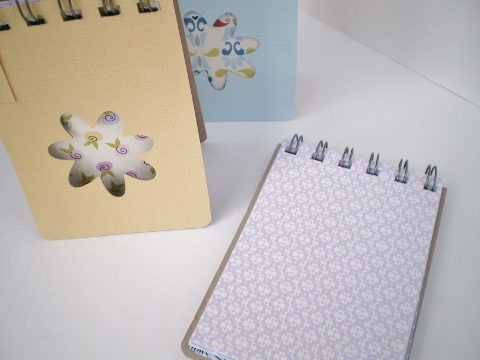 A place to stick all those notes, photos and ideas for the garden. 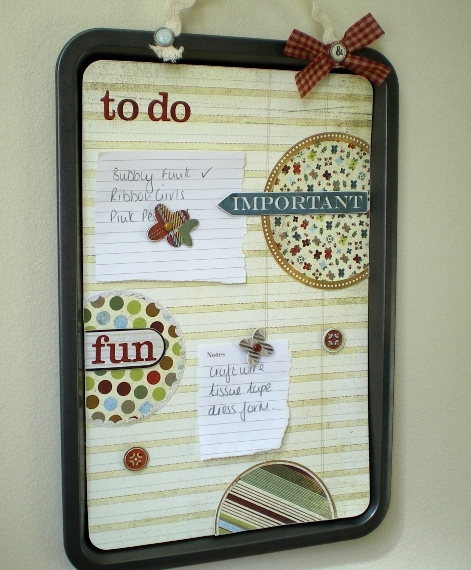 The frame is another in the Prima range of iron-ons. 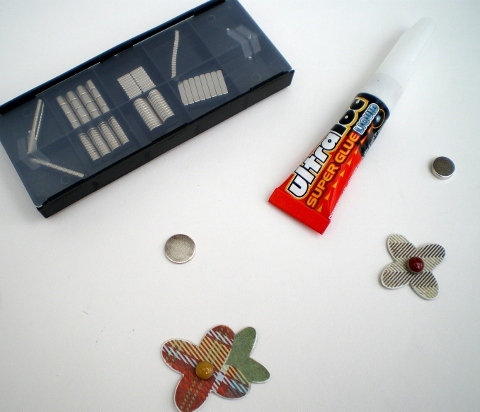 As usual the supplies list and a step by step guide to make it are over on the blog. 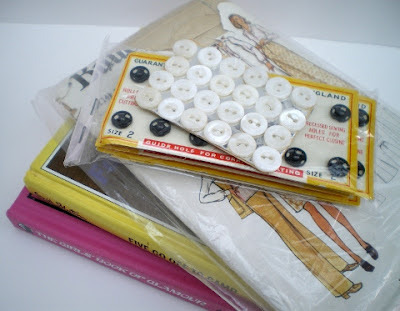 Just wanted to let you know about the fabulous giveaway over on The Ribbon Girl Blog. A fantastic selection of red, white and blue goodies from The Ribbon Girl shop could be yours. Check out the blog for all the details. The winner will be announced on Sunday 6th May 2012. 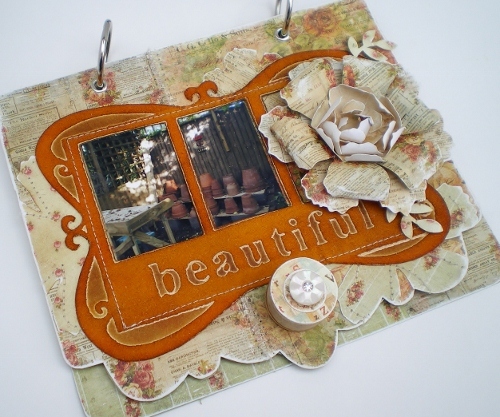 It's time for another challenge over at Let's Craft and Create. This time the theme is 'Special Occasion'. I've used my lovely new paper pad from MME for my Anniversary card. Check out the blog for some fabulous inspiration from the rest of the Design Team and the prize up for grabs for one lucky winner.